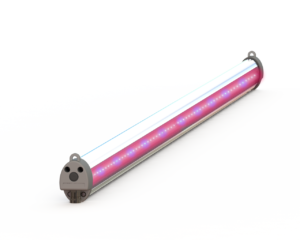 The Hyperion™ inter light is the perfect partner to the Hyperion™ top light or to supplement existing HPS/SON-T top lighting. The fixture has been designed to provide intra canopy light from state of the art LEDs. The inter light hangs within the canopy of high wire crops providing increased light at optimised spectrums to deliver higher yields from less energy.